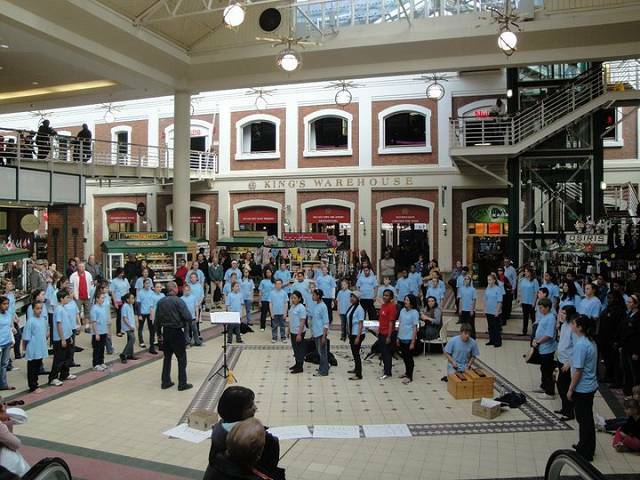 The South Cape Children’s Choir recently hosted the visiting Aachen Cathedral Choir, and shared a concert in the St Mark’s Cathedral, George. The concert consisted entirely out of church music through the ages, and was thoroughly enjoyed by all. Arrival at base camp: Word in Action campsite, Pretoria. CK is exhausted after an outing to Pretoria Zoo! Thursday morning is spent rehearsing at the Z.K. Matthews Great Hall, UNISA. "Think up! Swim up! Sing up!" Spinto soprano, Sandra Nel, from Vienna, with Olive Sandilands and Jan-Erik Swart. Sandra was the guest speaker at the SCCC's annual training camp in Herold's Bay. 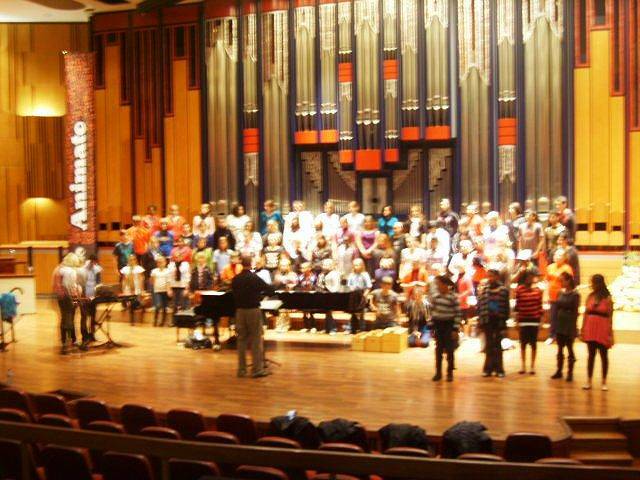 After singing a selection of German lieder and Afrikaans songs, and listening to the choir, she demonstrated valuable vocal techniques, discussing and answering questions on voice and tone production. She was impressed with the natural tone quality of the choir and inspired everyone with her exceptional voice that fills the auditoria of concert halls in Europe! Maggie Bodenstein, operatic soprano and member of Appasionata, posing with Jan-Erik Swart, Olive Sandilands and Jean-Mari Barnard (Grade 9) who is the choir's soloist for Pergolesi's Stabat Mater. Maggie assisted the choir in the training of voice parts for the Stabat Mater, which comprises 18 vocal pieces! During the four-day camp, members worked hard on their new repertoire, but also had time to relax!. 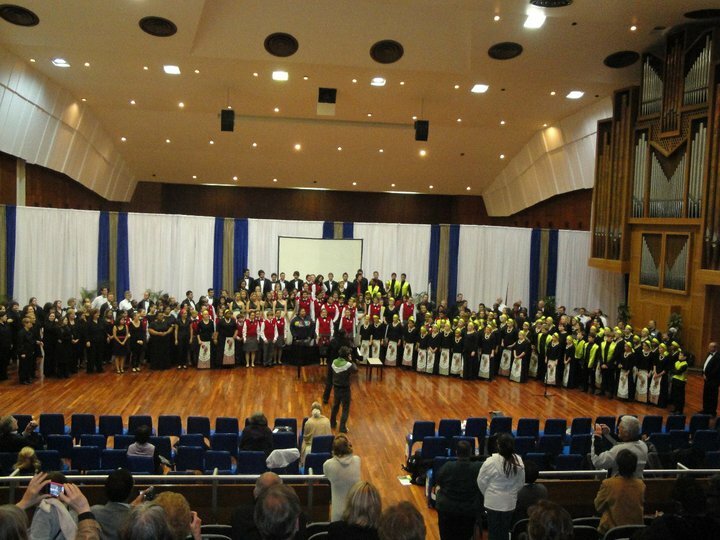 On Wednesday 6 to Friday 8 January 2010, the members of the 2010 SCCC gathered in George for their annual training workshop to prepare themselves for a busy year of concerts and performances! Each day began at 09.00 with muscle and relaxation exercises, vocal warmups, drama exercises, theory of music lessons, history of music lectures and rhythm drill training. Then came even harder work: Putting together the parts of a full programme of music which they had to learn during the December holidays! The choir was challenged to sing several pieces scored for double choir or 8 voice parts! The new choir members coped admirably, even though some looked exhausted by 16.00 of every day! 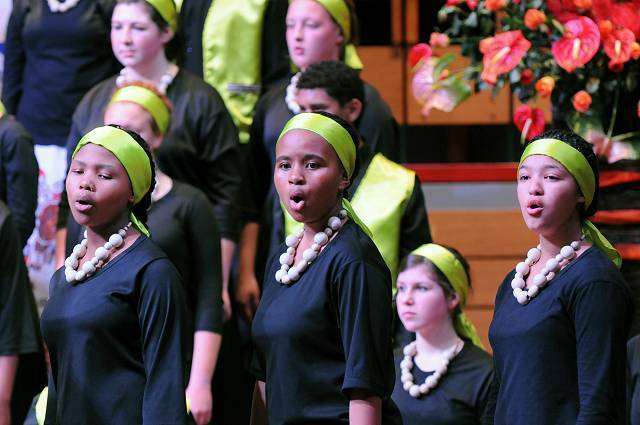 The following pics show that "Choir is not for sissies!"